Does anyone remember The Conduit? That ambitious Wii shooter that combined mystery and lore with with action fundamentals, and made a run at carving out a core niche on the system? Its developer High Voltage Software seemed primed to make a name for themselves on the back of that game and its sequel. After the tepid reception of Conduit 2 a couple of years ago, however, the talented studio all but disappeared into the contract work they were doing, with big name brands like Toy Story and Star Wars burying their recognition. Now, of all platforms, it seems like it’s iOS that has given them a new lease on life. From first-person shooter to endless runner, High Voltage’s Le Vamp (Free) puts you in charge of the safety of what may be the world’s cutest prince of the undead. Having just escaped from his crypt, the titular character charges headstrong out into the big wide world, obliviously looking for someone to play with amidst the dangers of sunlight, other monsters, and enraged townsfolk. 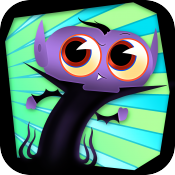 Naturally, it falls to you to keep him out of harm’s way…unless you’re the real monster, because seriously: who wants to see this adorable baby vamp bite the dust? 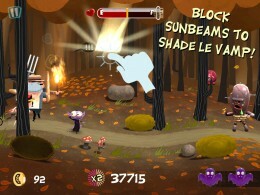 Unlike Jetpack Joyride (Free), where the game world buzzes around you to make you feel like you’re doing a whole lot, while only tapping the screen, Le Vamp asks you to have a stake in the environment itself…pun fully intended. Much akin to Kirby’s Canvas Curse on the DS, success here means juggling control over the dangers all around you, including the need to pluck up obstacles, cut down enemies, and create bridges over water. Meanwhile, long term survival depends on keeping your blood quotient topped up, flicking hearty pigs into Le Vamp’s hungry maw, while tossing garlic-filled oinkers out into the distance. Tantalizing coins and power-ups round out the mix, hovering on the screen to be nabbed quickly as you stalk along. It’s clear that High Voltage has studied the genre before making a run at it, as Le Vamp‘s play style feels wonderfully familiar while managing to add substance to a space more prone to imitation than innovation. 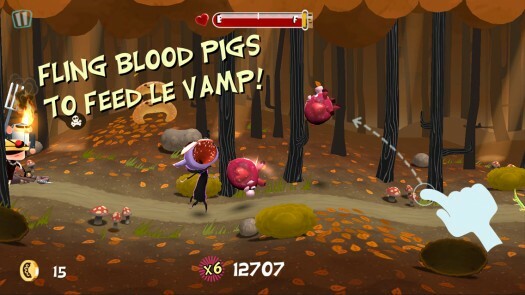 Each danger and perk is characterized by a distinct action – swipe up to pluck evil potatoes up from your path, down to drain “le wurst" sausages, tap to collect coins and activate power-ups. They flow together with ease and thoughtfulness, giving each round that flurry of co-ordinated finger movement that defines the best mobile time-killers. Power-players might feel like the difficulty curve stagnates the fun after the 1,500 “kilometer" mark, with some imprecise hit boxes making it feel impossible to keep up with the dance of dexterity required. That said, Le Vamp mitigates this pretty well with a stable of power-ups and upgrades that avoid feeling stale by playing to the game’s environment and mechanics perfectly. Whether it’s the time-slowing “jitterbean," the bat wings that help you soar above obstacles for a limited amount of time, or my favorite, bacon cologne to keep pigs from running away, each one feels worth unlocking and upgrading. High Voltage skirts that fine line between locking away abilities for challenge and keeping them hidden to encourage in-app purchases; rounds get noticeably easier and more diverse with each purchase, but it always feels like skill is the tool that gets you there. With the notable exception of a 3400 coin “swipe" power-up that forces you to buy the ability to collect coins intuitively, the balance here is spot-on. The mini mission style that pervades the genre makes an appearance as well, to mixed results. While a majority of the missions set goals that straddle rounds intelligently, and help carve out purpose for each play through, there are a host of item-driven combinations that feel poorly thought out. Fighting enemies while using a specific item, for example, is a repeat task that seems doable enough, but which clashes with the game’s randomness to make levelling up feel like chore now and again. Just like with its vampiric star, though, Le Vamp proves endearing enough to make up for its foibles. Like Disney’s Haunted Mansion (the ride, people, not the terrible movie), the game uses horror conventions to delight and amuse rather than to spook, and feels like the 90s cartoon version of a 30s black-and-white scary movie. It’s a shame that the promised “charms and curses" section of the shop hasn’t opened up yet, as I have a feeling they would have added even more flavor to the mix, but I’ll definitely be looking out for them in a coming update. Tip for those long bus rides, though: the “remixed" Translyvanian tune that underscores each round can get a little grating, so think about turning off the sound. Whether in your own crypt before you go to sleep, or at a family dinner with ghoulish relatives, Le Vamp is a charming, clever runner worth checking out. If your last flirtation with the genre was with something like Punch Quest (Free), this may just be one worth sinking your teeth into.